I went through my old photographs and came across a number of nostalgic pictures. The year was 1957. 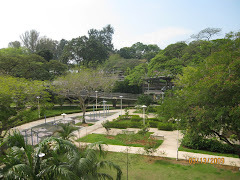 I moved from Joo Chiat Road where I grew up to our new house at Kampong Eunos to live with my parents. Television then was a novelty. 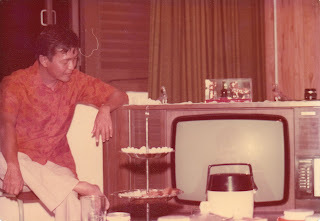 We were among the few households to own one in the kampong. The television set was made in Germany and the picture was in black and white. The picture quality depended on the antenna installed on the roof top. It flckered very often. Sometimes the fault was from the source and we had to wait patiently for it to resume broadcasting. 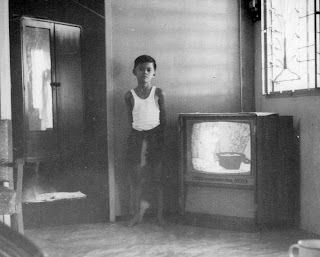 Every night the neighbours' children came to our house to watch the tv shows. I liked comedy shows such as Ed The Talking Horse. My present television set is still a cathode tube. It is more than ten years old and is still going strong. I shall change it to a LCD only when it stops working. 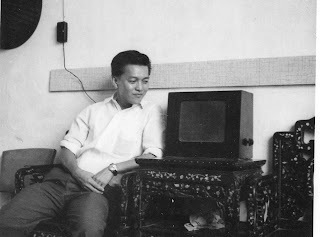 My grandmother's house at Joo Chiat had a Rediffusion box. In fact, almost every household in the suburban area had one. It was very popular with the young and old. It broadcasts news, music, story telling, entertainment and others. I liked to listen to Chinese songs and Oh Toh's story telling. The rediffusion box was hung on the wall, but I brought it down to a table so that I would not miss the story.